Ice Cream Ageing Tanks, Shrikhand Cup Filling and Cap Sealing Machines, Automatic Pouch Filling M/c. & Bakery M/c. 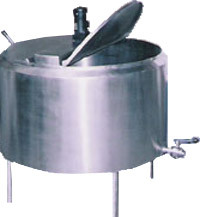 These compact designed icecream tanks are used for mixing and aging of mixture at required temperature. Manufactured from superior quality raw material like SS (304), these can be customized according to clients need.